X-Type Banner Stand, XBAN-B4 The X-Banner B4 is highly adjustable with telescoping arms and legs. 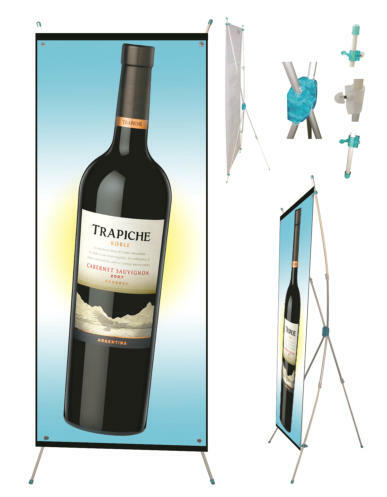 It can hold banners from 18” up to 40” wide, and from 59” up to 72” tall. It collapses down in one piece, and is very light-weight. This stand collapses down to smaller than any other X-Stand, and fits in most full-size luggage. It comes with a drawstring bag. Size Range: 18” to 40”wide x 59” to 72” tall. Case qty: 40.